but I will, a little. Not on matters of substance on the evolutionary history of the human body, as discussed in his book, Your Inner Fish. I’ve just begun it, and so far, it’s great. I’ll blog a bit of a review when I’ve actually gone through the whole thing, but for now, I want to raise a point that we confront every year for our science writing students at MIT — the problem of placing numbers in context. How can we visualize events that happened millions and in many cases billions of years ago? Unfortunately, there were no eyewitnesses; none of us was around…Even worse, the animals that existed back then have been dead and buried for so long their bodies are only rarely presereved. If you consider that over 99 percent of all species that ever lived are now extinct, that only a very small fraction are preserved as fossils and that an even smaller fraction still are ever found, then any attempt to see our past seems doomed from the start. There are at least two problems with this, both illustrative of common errors in science writing for the public. The first is a kind of science-yness contained within the sudden eruption of a statistic: the fate of 99 percent of all species that have lived on earth. What does that number mean? Nothing, here. Neither that number, nor the facts that follow — the fractions that leave fossils, the remnant that might be found — tell you anything about the quality of the evidence or of the statistical reasoning one could attempt based on those fossils that are discoverable. Put the same thought into a different context. Amazingly, even though there is a poll of 3,000 people to discover the current state of US opinion about President Bush, amazingly, the opinions of 99.999 (as of July, 2007, according to the CIA) percent of all Americans remain unknown! Surely any attempt to guage US political opinions seems doomed from the start!…Or not. The analogy is not quite fair of course. But the underlying point remains: the issue is not how many species have gone extinct, but whether the recoverable record of their former existence is robust enough to support the conclusions Shubin wants to draw. The use of a faux statistic here — or if not false, then so contextless as to be free of meaning — serves merely to distract. It lends the appearance of rigor, of a kind of authority. Look, it says: scientists use numbers; they can quantify their knowledge — which must mean they really know something. But if the reader smells a rat, if he or she notices that number is off-topic, not relevant to the actual argument being made, then any rhetorical advantage is lost. You’ve just given your audience a reason not to trust you. As readers of this blog know, I am a big fan of finding simple ways to express numerical reasoning to broad audiences. This is how not to do it. Don’t just throw numbers at the page. Show how they actually work. Make explicit the argument that your knowledge of the numbers and their relations express. Stay away from the “three out of five dentists recommend…” sleight of hand. There…I got that out. Now for the other point. This really is one of rhetoric. Shubin finishes off the passage above by telling his readers that “any attempt to see our past seems doomed from the start.” But of course that’s true only if the preceding statement makes sense, which I’ve just argued it doesn’t. Really, though, what is that comment doing here at all? It’s an old rule in story telling: don’t give your audience a reason to tune out. Telling them up front that there is a good reason to think that what you are about to talk about couldn’t happen would seem to violate that rule. What makes the slip more frustrating is that Shubin immediately launches into his genuinely remarkable story of how he and his field performs exactly that “doomed” task. Turn the page, just that one page, and Shubin launches into a clear, personable, and persuasive account of the task of finding a fossil record and the implications of doing so for understanding events in deep time. That’s a classic opening, placing us as the Latinists among us would say in medias res (h/t Mrs. Small, Berkeley High School’s erstwhile defender of classical education) — in the middle of the matter. We are there with Shubin, we are seeing our inner fish for the first time, we are shivering in the snow at some exotic, romantic location, and we are ready for our guide to tell us how we got there, and where we go from here. That’s how you begin a piece. So why the throat-clearing (for that’s really what I think it was) of the prior page? If I were to play text-doctor at a distance, I’d guess that what happened here is that either Shubin or his editor didn’t trust the strength of their material. Someone decided that the reader needed to be tricked into reading a fish story (though they would not have thought it in quite those terms). The narrative hook being set seems to be that of the heroic researcher performing the impossible — that “doomed” attempt to read the past. Better, by far, IMHO, just to get on with it. The moral: less is better, and above all, trust your stuff. One last thing: I’m picking on Shubin here not because I think his is a bad book. Quite the contrary: as far as I’ve read so far, its a very good take on an important subject. Most of it is exemplary science writing: communicating deep ideas with a light touch in a manner intelligible to any interested lay person. Go buy it. Writing anything is hard; science writing is particularly confounded by the need to express often highly abstract ideas in concrete, lay-and-language friendly terms. So read this post as just me taking advantage of what are in fact minor mistakes in Shubin’s fine book to point out a couple of common pitfalls in the practice. 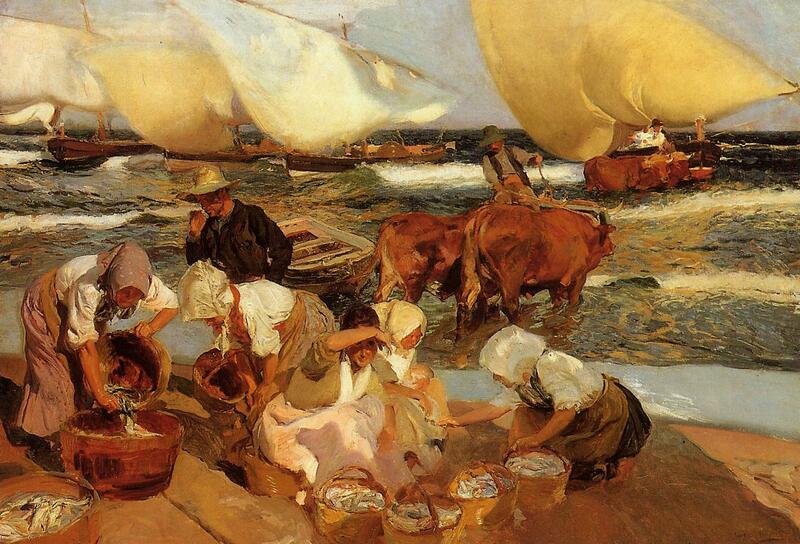 Image: Joaquin Sorolla, “Beach at Valencia” 1908. Source Wikimedia Commons.